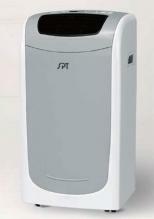 A dual hose portable air conditioner is an excellent way to cool your room. Make sure to take into account where you are going to vent, and that you have enough power in the room to run these devices. Dual hose portable air conditioners are an excellent way to cool an area. Featuring 3 in 1 technology: air conditioner, fan, dehumidifier - all in one.